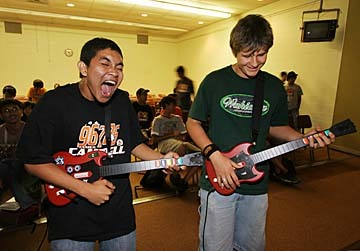 The Ewa Beach Public & School Library hosted a "Guitar Hero Tournament" for kids ages 13 and up on Wednesday. 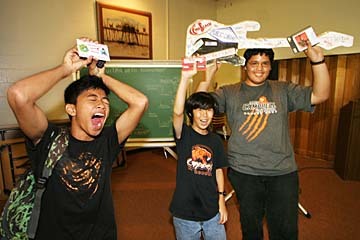 The video game competition was limited to the first 16 kids who had a library card. Ranier Navvasca, left, and Michael McLaws got warmed up for the competition. During the tournament, Jordan Cabral, left, Alex Cunningham and Mark Giroux rocked on for their favorites. 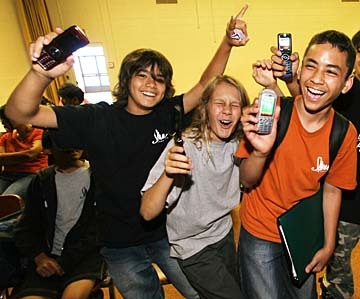 Far left, third place went to Brendan Scott, left; second place to James Platt, center; and first place to John Brignoni.